Panama Esmeralda – Is Ready! Are You? Our first batch of Panama Esmeralda was roasted today and lucky me had the chance to witness the whole roasting process at the Batdorf and Bronson Roastery in Olympia, WA. 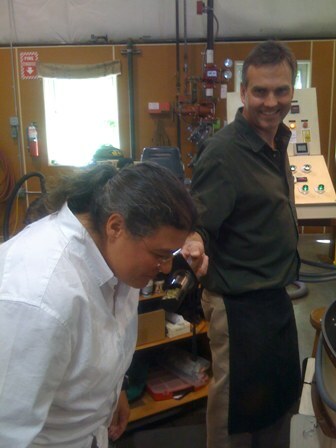 That is Scott Merle letting me take the 1st sniff of the green coffee minutes after is was loaded into the roaster. 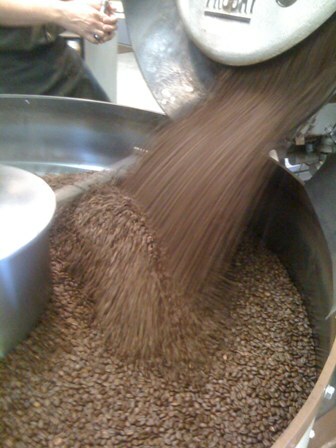 This is the 1st batch of the roasted Panama being dumped into the cooling tray and – a Cup of Gold! See more pictures – click here. 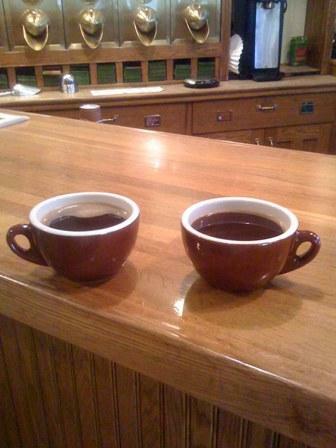 I will be posting more info later about the day and buying the Esmeralda at Tazza D’Oro beginning Thursday, Aug 7th- gotta go. mmmmm.... Early roasting smell of grassy and bready popcorn. yummy! !